You can hear the music that will be in the painting, in the next link, starting at 1:19, ending at 1:40. This is powerful music that I have wanted to paint for a long time. Because of the Vivaldi Four Seasons series, every time I have made time to paint a partner work next to the Vivaldi, I have always chosen modern music. For me these side works learn from the Vivaldi. Because they are much smaller it is easier to experiment with them, and in that way sometimes the Vivaldi work gains back. So, it was only through good fortune that I have interrupted my work on this years Winter Vivaldi to work on this other classical piece that has been on my to-do list for a long time. 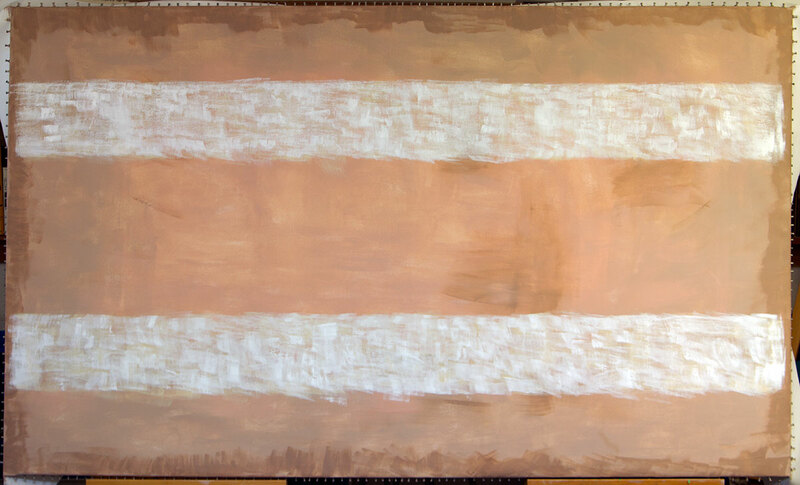 When I received the request to paint this Bach work, Crossroads was the one painting the customer picked as a guide especially for its color and overall lightness of the work. Well that was 2008 and now in 2014 my style and my art has involved considerably, making it impossible for me to go back and repeat the past. Few of my artworks repeat, they all tend to build on each other. Today I see Crossroads, as dull, flat, sloppy in technique, with bad usage of drab colors. Still it will help me make a better Bach. I have found helpful direction for the Bach work, in Crossroads, especially in its overall use of color. Crossroads, the painting, was an experimental work 16 inches by 40 inches. I used a large plaster bristled brush as a new painting tool. That was a technique that I have rarely used since. I consider Crossroads a marginally successful artwork that stands on its own, as a one time idea. For today, though, it has been valuable guide for this Bach work. Maybe, that is why I painted this work in 2008, not knowing that one day it would offer I new perspective and a new opportunity to move this art forward. Bach BWV 1014 Adagio Image 1 stage 1 of the background. The take on image ones, including this one, is to pick colors that probably work with the theme, and spread some paint around. 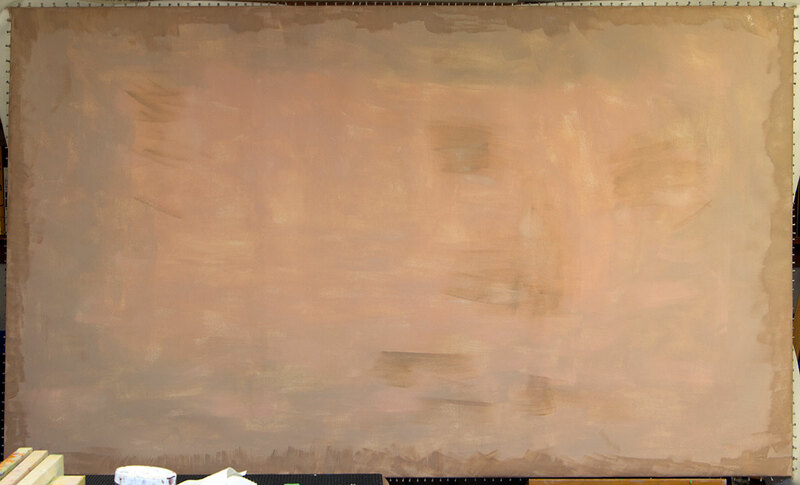 As I am painting this first layer, I have Mark Rothko in my thoughts, but I am not trying to carry out anything special here, I am only trying to cover up the canvas. I difference with this work, is that I have usually left a white bar on the top and the bottom. For this work, it felt better about forgetting the bars. 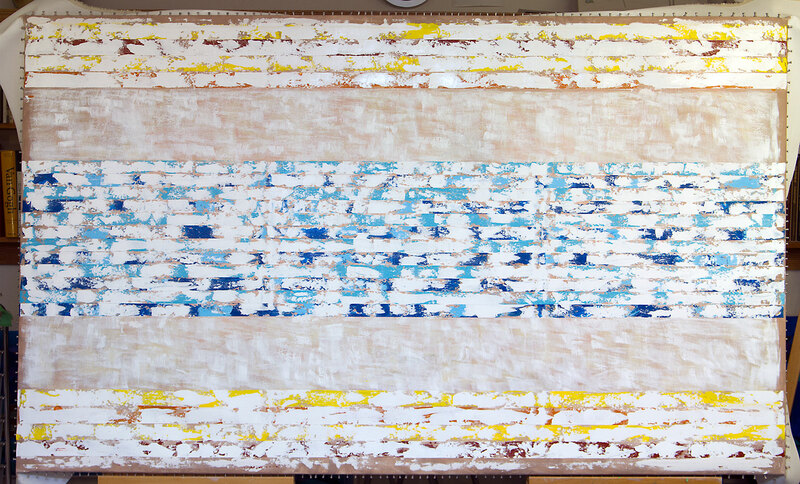 The main reason I felt this way about this work is that when finished I will remove the artwork from its home-made stretcher, and then carefully rolled it up for shipping. It will then be re-stretched: I want no sharp edgings to interfere with the re-aligning of this artwork. I think that makes sense. I will say, seeing this work in person it, dominates the space, and creates an impressive look, even though it is early in its development as a contemporary artwork. Bach BWV 1014 Adagio Image 2, stage 2. 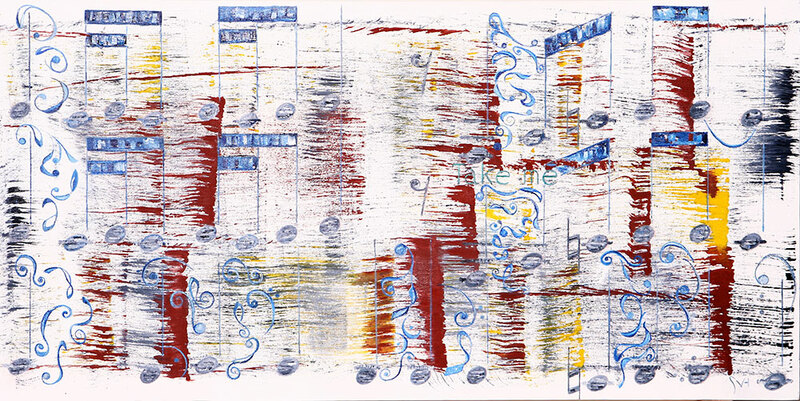 Here you are seeing the influences of Mark Rothko and of the early Mozart work. Nothing special here. What these two bars are doing is giving me the placement for the music. Bach BWV 1014, Adagio image 3,stage 3. Now, finally you are seeing the direction the background . There is a lot coming from the unfinished Vivaldi Winter. I have looked at it for direction as much as I have looked at the painting Crossroads for color. With the help of Barb I was finally able to find the artwork Crossroads, buried among the giant works. Looking at this artwork my opinion has not changed. Hopefully, someone with a passion for Eric Clapton, The Creme, or just the great blues song that is Crossroads, will contact me to buy this interesting little painting. I have this artwork listed on Etsy, for a reasonable price of $200.00. Up next is to finish the background, in one session, and then start putting down the music. ~ by Scott Von Holzen on 02/15/2014.